Listed below are the Fall 2018 service placements associated with each Freshman Service-Learning Course. Read each placement description listed for your class located on the FaithJustice Web Site. Each placement description offers a volunteer profile. This profile will be helpful to you in your decision making process. What kind of service does the organization provide? What population does the agency serve? Are volunteers expected to take initiative at the organization, or are there specific tasks that must be performed by the volunteers? Are there specific qualifications required by the organization that I may or may not meet? Am I willing to venture outside of my comfort zone to volunteer at an agency that will support my decision to grow? In addition to the information provided on the placement description, we encourage you to do your own research and go to the agency website. We do not include agency websites on our placement descriptions for internal, administrative reasons. However, you should be able to access most agencies using one or more search engines. For questions about your the service placements offered to your course, please visit PLC 131 to meet with the Placement Liaison associated with that Community Partner. Ed Brady, SJ was born in New Orleans, LA, graduated from St. Charles College and entered the Jesuit Novitiate in the New Orleans Province. Fr. Brady was ordained to the priesthood in 1959, professed his final vows to the Society of Jesus in 1963, and came to Saint Joseph's University in 1969. From 1970 to 1976, Fr. Brady served as Director of the Peace Studies Center. In 1977 he became the founding director of The Faith-Justice Institute. In 1979 he left Hawk Hill to direct the Bread for the World Education Fund. He became director of the Catholic Office for Emergency Relief in Thailand (1981-1985) and then was Education Coordinator for the UN High Commission for Refugees (1985-2000). From 2000-2007, Fr. Brady served as Spriritual Director at St. Paul's Seminary in Nairobi, Kenya. 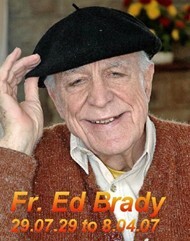 Ed Brady, SJ passed away in 2007. At the celebration of the 30th year of its creation, The Faith-Justice Institute initiated an annual faculty award, the Ed Brady, SJ Faith in Action Service Award to honor the memory of its founding member.